On the evening of 15th September, Jaguar Land Rover revealed its vehicles that will be appearing in the new Bond adventure, SPECTRE. 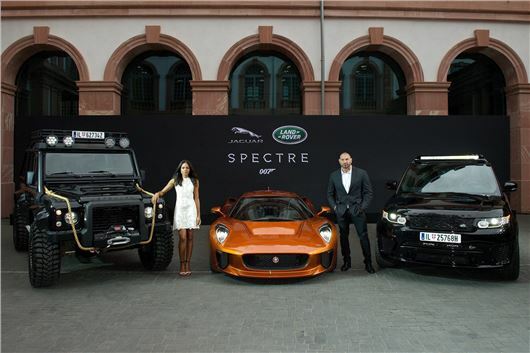 Accompanied by stars David Bautista who plays the villain Hinx and Naomie Harris who plays Moneypenny, the care are a highly modified Land Rover Defender, the Jaguar C-X75 and a very special Range Rover Sport SVR. Cars, including the Jaguar C-X75, Range Rover Sport SVR and the iconic Land Rover Defender, stole the show as they were unveiled in public for the first time at the palatial Thurn und Taxis in Frankfurt. SPECTRE is the 24th James Bond film, from Albert R. Broccoli’s EON Productions, Metro-Goldwyn-Mayer Studios and Sony Pictures Entertainment. The Jaguar C-X75 stars in a high speed night chase through the streets of Rome driven by Hinx, played by David Bautista. The C-X75 supercar, rated the most advanced Jaguar ever created, was provided by Jaguar Land Rover Special Vehicle Operations (SVO) in collaboration with development partner Williams Advanced Engineering headquarters in Oxfordshire, England.